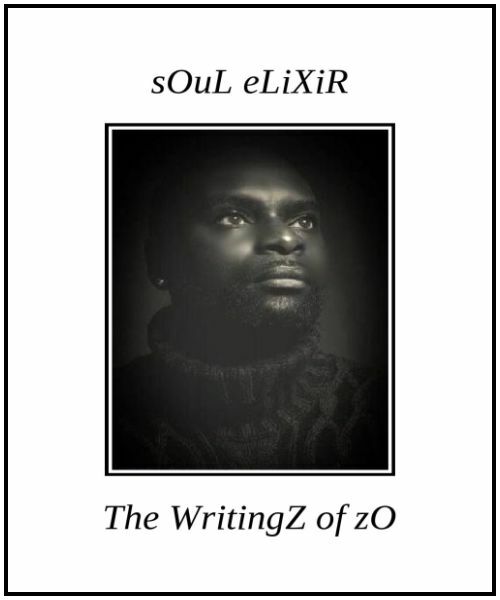 sOuL eLiXiR: The WritingZ of Zo, is poetry from the heart and soul of Zo-Alonzo Gross, in the American rap tradition it exists inside the New Age Renaissance Republique as Sun Salutations, “now I rise to greet the blue morning.” Zo-Alonzo Gross was born in Bethlehem, Pennsylvania. He graduated from Temple University, with a B.A. in English and a minor in dance. He danced at the age of 18 at the legendary Apollo Theater and published his first book of poetry and art, Inspiration Harmony and the Word Within, 2012. He is featured in the documentary about art nouveau poetry “VOICES”, directed and produced by Gina Nemo. Like a starburst, this new take on the poetry genre, emerges and shines in the New American School. As the engenue of wise child-like wonder, this poetry creates exciting innovations in language and syntax. The language harkens to Old English and the usage of words in Shakespeare’s plays and sonnets, reinvented for this New Age creation. This usage gives a certain “poetic dreamscape” that grounds the writing in a place of magical mystery, as the bards of long ago. This old-time language mixed with Black meme and consistent rhyming couplets, as rap music, creates powerful new poetic climes. With the use of syntax, all those exciting symbols atop the numbers at the top of the keyboard, have been spilled across the page to create a pictograph poem, an accentuation and elaboration of the words in a picture, an exciting innovation. This poetry exists inside the all seeing, all knowing love of the Poet, as a healer and Oracle. The Poet brings wisdom and light, hidden Holy Spirit knowledge out-shining the dark forces of the undertow of the war society, creating healing and hope. In the quest for human suffrage the positive soul affirmations exist inside the beauty of whirly gigs and windmills. As if some sweet times harkens to the New Age and the peace society that is coming. in more wars then I wish 2 remember. This Jaded Cloud shalt no longer abound. lendeth a deaf ear 2 its sound. The story-teller magic inside rockabye lullaby is a quiet anarchy of the new word for peace . . . read the good news, a celebration of love from the Earth Angel, Zo-Alonzo Gross, sOuL eLiXir: The WritingZ of Zo.